432 Park Avenue: The Deal on NYC's "Matchstick Building"
In this city of soaring skyscrapers, it takes a lot to stand out from the crowd. Which says a lot about the cropped-up tower that's been capturing the attention and curiosity of visitors and locals alike. Yes, anybody who's bothered to look up of late in Manhattan will have by now surely caught a glimpse of lean-and-lofty 432 Park Avenue, dubbed the "matchstick building" (for its shape and appearance) by the media and locals. Completed in late 2015, this slender supertower is now positively dominating the Midtown skyline. So, just what is the deal with 432 Park Avenue? Developed by CIM Group and Macklowe Properties and designed by architect Rafael Vinoly, this megatower was built for private residences and offers 104 luxury condominiums. The tower construction was finished in December 2015 and is located on Park Avenue, between 56th and 57th streets, close to Central Park. At 1,396-feet-high, 432 Park Avenue measures tall enough to command the title of the tallest residential building in the Western Hemisphere. In New York City alone, it's overtaken the Empire State Building (at 1,250 feet) and Chrysler Building (1,046 feet) in height but still falls behind the One World Trade Center (at 1,776 feet)—though the latter only reaches higher because of its towering spire. It's all about the (multi-)million-dollar views here, which span the Manhattan skyline and Central Park. Apartments boast oversized 10-foot-by-10-foot windows to maximize the light and cityscape. Unless you have some rich friends who snatched up a unit inside, however, the dramatic views won't be open to the visiting public. 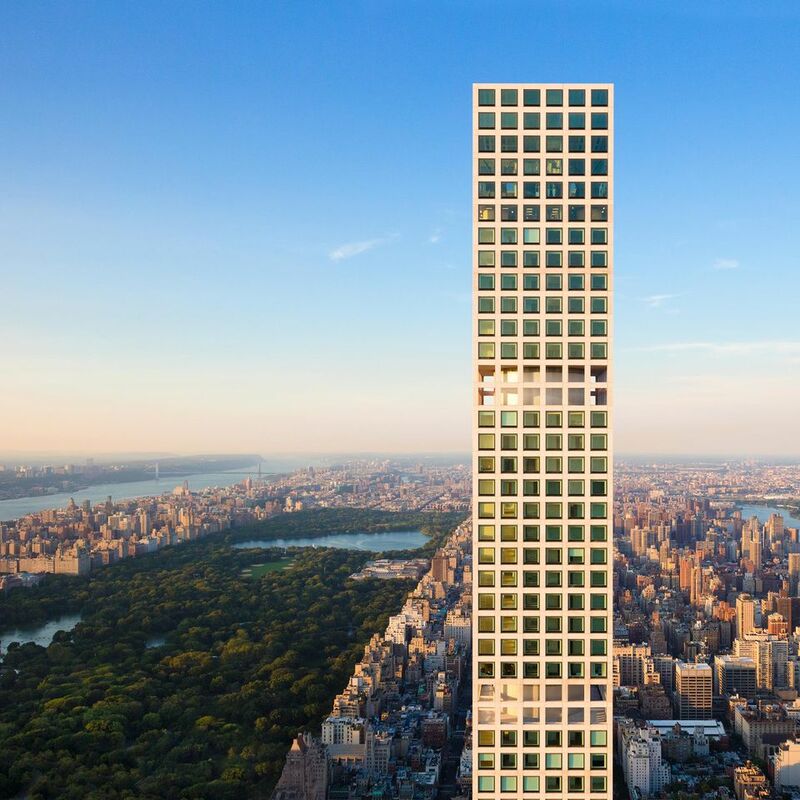 According to a press release, residents of 432 Park Avenue can additionally expect 30,000 square feet of amenities including a private restaurant; outdoor garden for dining and events; spa and fitness center with sauna, steam, and massage rooms; 75-foot indoor swimming pool; library; lounge; billiards room; screening room and performance venue; children's playroom; and boardroom. You'd better start pinching your pennies. The 104 luxury units come designed by Deborah Berke with expansive layouts, 12.5-foot-high ceilings, oak flooring, Italian marble countertops, and high-end finishes and appliances. As of December 2016, remaining residences at 432 Park Avenue ranged from 1,422 square feet to 8,255 square feet in size, with a starting price tag of $5.1 million (and going up from there to $82 million. Sorry, but the penthouse has already been snatched up for a cool $87.7 million. Do You Know Why New York City Is Called the Big Apple?